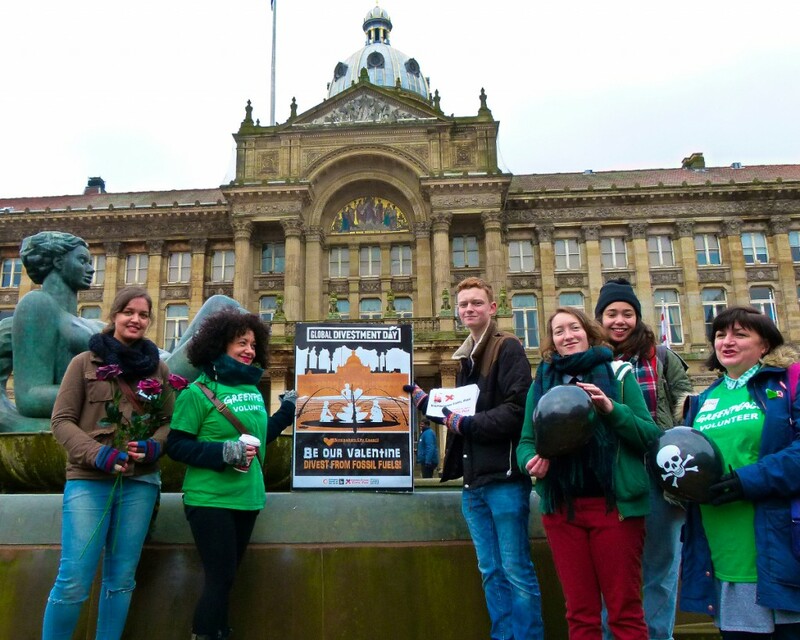 Divestment Day comes to Brum! On the 14th of February Birmingham’s Victoria Square was taken over by an orange banner and a group of determined activists fighting for divestment from fossil fuels. The action was one of over 450 organised in cities across the globe as part of Divestment Day. The Day of Action was the latest part of the fast-growing divestment campaign Fossil Free. It’s a shocking statistic, but only 200 publicly-traded companies possess almost all the known listed reserves of coal, oil and gas in the world. The idea of divesting from fossil fuels is simple, the Fossil Free movement is asking for goverments, organisations, institutions, and even the individual, to immediately freeze new investments, as well as divest current investments, in these 200 companies. Divesting from this industry should diminish the power of these multi-national companies, and hopefully encourage greener more sustainable solutions to implemented throughout the whole world. On a more local level, many UK local authorities have public money invested in fossil fuels, particularly through pension funds. This could have disastrous consequences when the carbon bubble bursts. As money markets realise that fossil fuel reserves cannot be burned because of the damage they are causing to the climate, local and national goverments’ shares in fossil fuels will become worthless. The Birmingham Fossil Free action was organised by Birmingham Climate Justice and Birmingham Friends of the Earth, with help from Climate Action Network Birmingham, and Birmingham & Black Country Greenpeace. With Birmingham Green Party and University of Birmingham People & Planet also in attendance, it meant that there were 6 climate groups involved and all parts of Birmingham’s environmental movement were represented. However the action wasn’t just limited to environmental groups, with Birmingham Jubilee Debt Campaign also taking part. 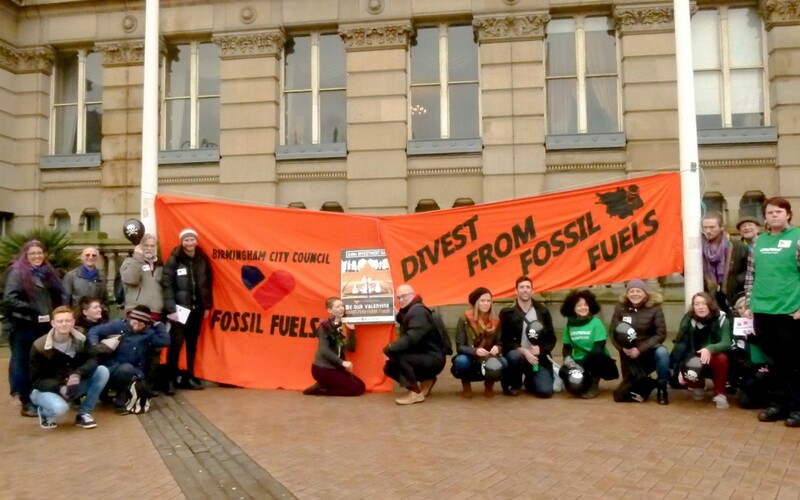 During the action campaigners presented a giant Valentine’s Card to Birmingham City Council, asking for the Council to divest from fossil fuels, posed for an inspirational photoshoot with the orange banner, and talked to members of the public about the campaign to gain their support. Overall it was a good day, despite the lack of sun shining down on Victoria Square. 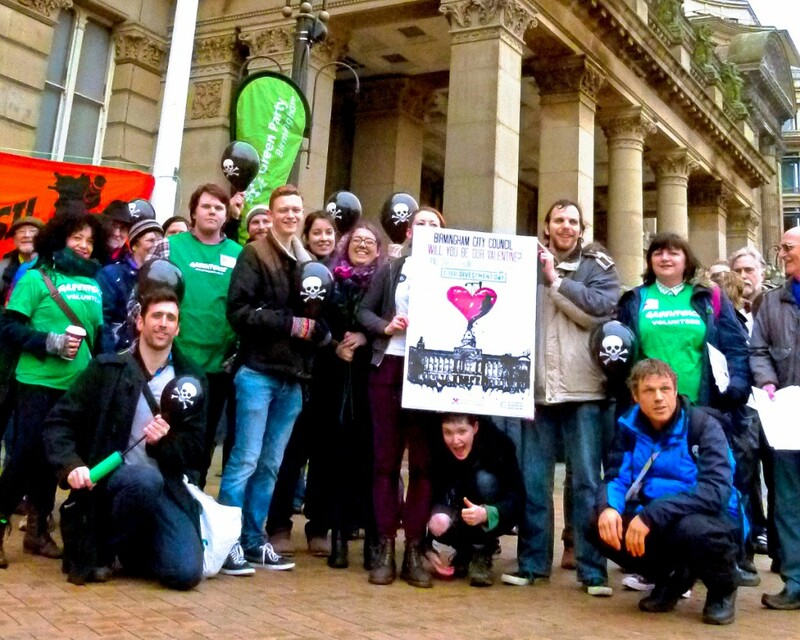 Hopefully the action, and the growing Birmingham Fossil Free campaign, will encourage Birmingham City Council to think seriously about divesting from fossil fuels, and push them to take action in the future. Visit the Fossil Free website to find out more about the campaign and how you can take action on divestment.